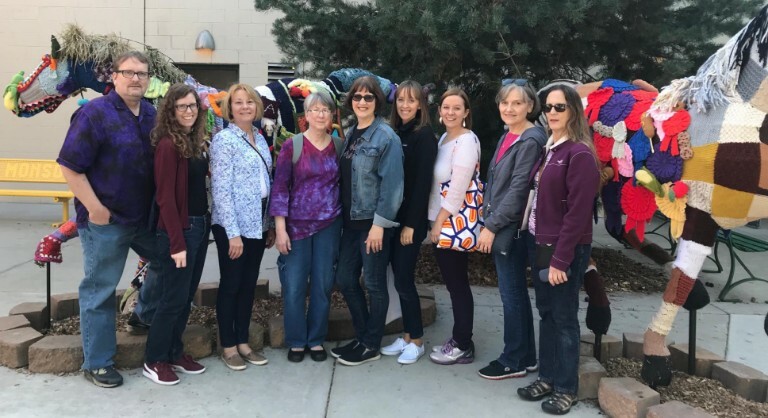 Textile Center Staff at the 2018 Minnesota State Fair (yarnbombed horses in background). Unpaid internships are available offering a wide range of experiences in a variety of our departments, including gallery exhibitions, education, events, and library. Please contact us for more information. Internships are flexible, and we are happy to work with you to meet requirements for credits towards a degree or class. University of MN Retail majors: a paid retail internship is available for fall semester. See GoldPass for more information or to apply. Textile Center would not exist without the generosity, commitment, and talent of our volunteers. It is a creative and vibrant community of artists and enthusiasts who share their skills, help us fulfill our mission and allow us to offer incredible programming for the community. If you are interested, please fill out the form below, or feel free to email Sharon, our Volunteer Coordinator, at smulhollam@textilecentermn.org. 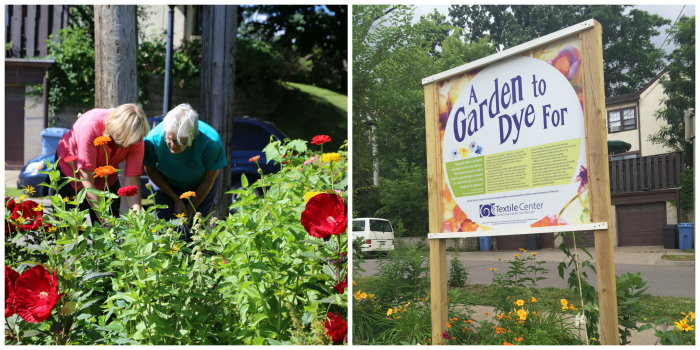 We are revamping our natural dye garden surrounding the building, and we need volunteers to help! Work days will be scheduled throughout the summer and will include digging, planting, weeding, and watering. Are you a photographer looking for experience? We are looking for a volunteer photographer for gallery openings, classes, and other events. Textile Center is home to one of the nation’s largest circulating libraries of textile-related books and periodicals, and we depend on volunteers to make it happen. Duties include assisting patrons with finding books and checking out materials. If you like meeting interesting people and working on fascinating fiber projects, you’ll love your time in the library. Weekday, evening, and Saturday shifts are available. Help install works by leading and emerging fiber artists! Textile Center has approximately 1,800 square feet of exhibition space and all of it turns over multiple times each year! It takes a tremendous amount of work to install and deinstall each exhibition, and we are grateful to our group of dedicated and talented gallery volunteers who make it all happen. We’re looking for enthusiastic people to join our team of exhibition volunteers. We need people that don’t mind spackling, sanding, and painting walls. Our annual World’s Largest Garage Sale happens on the second weekend of April at the UMN ReUse Center. Over 200 volunteers receive, sort, and price mountains of donated fabric, yarn, and other fiber art supplies over the 3 day event. Volunteer signups open at the beginning of February. Our Garage Sale Pop Up happens in the fall at Textile Center!